Oxy Heli offer 3 Blade Head System for OXY3 Heli. ….Hard to say which system is the best for the Oxy 3: 2 Head or “Qube”.. we believe after many hours of testing with different configuration , FBL set up and head speed, that the 2 Head system on the Oxy 3 has better performance for pilots that like the hard 3D and the ultimate agility. The “Qube” system per design, increases the cyclic response, giving a better FBL control and increase the main rotor disc load and the main disc lock effect. These effects support pilots that like a more precise and sedate Oxy 3. The “Qube” system can handle with incredible performance low Head speed, which can support also who as sport flyer need longer fly time. Everything depend on your need and your feeling, my personal first feeling was weird, because really different and impossible to compare the “Qube” with the 2 Head System, but after few flights, become a new and enjoyable way to fly my Oxy 3. - Direct replacement for Oxy 3 head System. - New and different way to fly your Oxy 3. - Easy to build and repair in case of crash. - Unique look and fly sound. 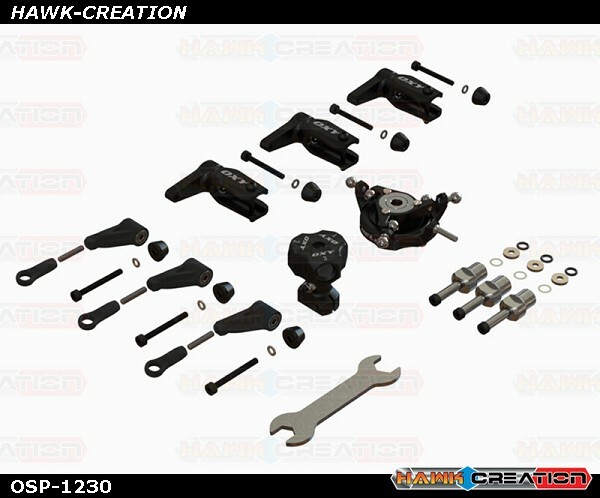 - System comes with DFC rod and optional Hybrid Pitch Rod System. Hybrid system suggested with Head Speed Lower than 3500 rpm. Follow user manual for more information of final assembly. 3 Head System need a different FBL set up compare the 2 Head. For easy start up, you can easy download and check Luca Invernizzi set up file here below for Brain / Ikon and V Bar. Oxy 3 – 3 Head System – Brain/Ikon - Luca Invernizzi Set Up. Oxy 3 – 3 Head System – V Bar - Luca Invernizzi Set Up. Present set up file are the raw file for your Brain / ikon or V BAR and was tested by Luca Invernizzi. Select FBL system you have and download the set up file. Save in your computer and upload the file direclty in your FBL system. 5- Full functionality of our set up file in your heli system. If you dont want use our file directly in your heli, just save your current set up and after download check in demo mode our value and copy manually in your system.